Folk myth + feminism + sweet sweet lovin' = huzzah! Amol Palekar's Paheli is an equation of love, oh yeah, baby. It's also sensitive, intelligent, and different, a perfect woman's fantasy, sending barbs to our squishy heart. It manages to transmit both that sense of stylized archetypes we find in old folktales, as well as modern themes of spousal obligations and women's needs. And it does all this while still retaining the human aspect! We even cried in the end. Oh, how we cried. Somewhere in ancient, untouched Rajasthan, a woman named Lachchi (Rani Mukherjee) is marrying into the rich trading family of Kishanlal (Shah Rukh Khan). While Lachchi's lady friends warn her about the inevitable bom chicka wah wah that accompanies wedding nights, Kishanlal turns out to be a repressed, fussy asexual, more preoccupied by his wedding accounts than his newly acquired wife. Lachchi is understandably disappointed, and she's even further let down when Kishanlal announces he'll be going away on business for FIVE YEARS. Lachchi cries. But unbeknownst to her, a ghost/demon/spirit (Shah Rukh Khan) has taken a most uncharacteristically human fancy to her. As soon as the husband's out of sight, the ghost promptly assumes his moustachioed, dimpled form and comes waltzing back into the bedroom. Lachchi, I'm ho-ome! Apart from being infatuated, the ghost also exhibits other strange signs of humanity: he cannot tell a lie. So after confessing his otherworldly origins (and turning the romantic charm onto hyperdrive), he offers Lachchi a choice: either wait for your deadbeat husband who gets turned on by balancing the accounts to return, or get this new, shiny lookalike who loves you for really real. And's gonna love you aaaall niiiight looong. Is it any surprise who Lachchi picks? He-llo. Naseer shall be king of all puppets! Well, it's all fun and sexcapades until the real husband turns up after five years, right when a pregnant Lachchi (Rosemary?!) goes into labor. Demon baby! "Huh?" the villagers cry. "Who's who?!" We get double Shah Rukh (believably done) and a very confused supporting cast. Clearly, it's time to call in the Patriarch of Bollywood, Amitabh Bachchan (helpfully dressed as a goatherd), to settle the score. But first, let us pose a philosophical query: who is the real "husband"? The legal one who went through the rituals, or the nonhuman one who really really loves her? Amitabh will crush you with his hot coals of justice. Throughout the film, two puppets drop down from above to narrate and comment. 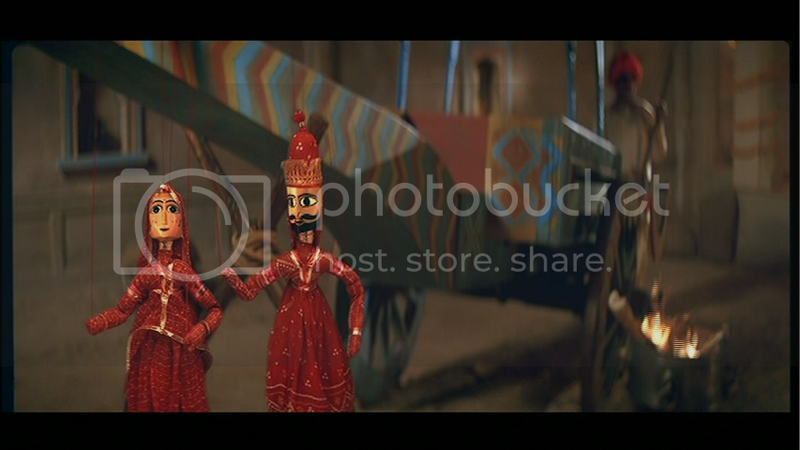 The fact that these puppets are voiced by Naseeruddin Shah and his wife, Ratna Pathak Shah, as well as the fact that Amitabh Bachchan shows up for five minutes in a comically large turban, should be signal enough: this movie has been endorsed by the rulers of Bollywood and Parallel Cinema alike. And indeed, this film is one of those rare gems where the commercial blends with the aesthetic/intellectual to make something appealing for all of us (or, rather, every part of us). It presents us with interesting ethical dilemmas too: all three characters (Lachchi, Ghost, Real Husband) have sympathy and depth, making a tidy ending impossible. The conclusion is fascinatingly ambiguous, leading us to go all Freudian and declare that the story was really about one husband's dual responsibility (to work, and to home) and repressed need to be loved. And thank goodness for respecting the woman's wishes. Finally! A wonderfully meta finish. Because we're all puppets on parade, aren't we? Shah Rukh Khan's charm is nearly overpowering, especially when he's playing Every Girl's Dream Boat, the Ghost. Here is a man (well, man-like entity) who will shower you with praise, remain loyal, love you everywhere and anywhere, and has no fear of crying. Be still, our hearts! Shah Rukh is also excellent in juxtaposing Perfect Husband to the nerdy Kishanlal; most impressive was how he managed to infuse this comical, traditionally villainous character with a big heart. Poor dear. Rani Mukherjee is also lovely as Lachchi, though she really doesn't have to do much other than go "whoopee!" when she gets her ghost and cry when she doesn't. More interesting is Juhi Chawla, older and wiser since her Naajayaz days, who carries a lot of depth in her Penelope-like role. We should also note Dilip Prabhavalkar as the pothead uncle, and Rajpal Yadav as the harassed mailman constantly delivering letters between the two Shah Rukhs. (I want to write in "we" when I leave comments here.) 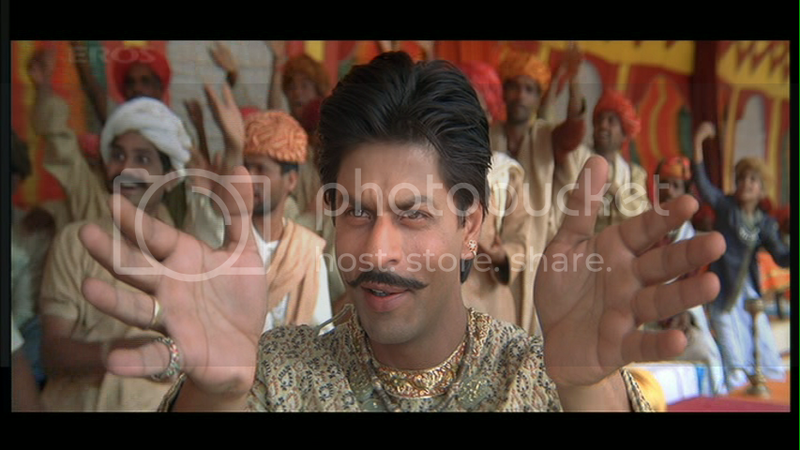 I heart Paheli big time except for the ending, which made me furious. That's a great point about the big daddies of Bolly and indie being present - I'd never thought of that. And how nicely contrasting their presences are. One showy and in a big hat; the other floating around in voice form. Neato! Good to find someone who liked the film, and saw the feminist point of view in it as well. The chicks I've spoken with unfortunately didn't like it much, and seemed to be hating on Rani 'coz they thought she didn't look good. And, every guy I spoke with, in addition to hating on it to prove that they're males, added that Rani was so.. *that* (eventually I'd draw out of them that they mean forward, or lusty, or a cheater, or.. whatever soothed their disturbed egos...) Well.. good good.. I heart Paheli too! :D Thanks! First movie I have disagreed with the ppcc on. 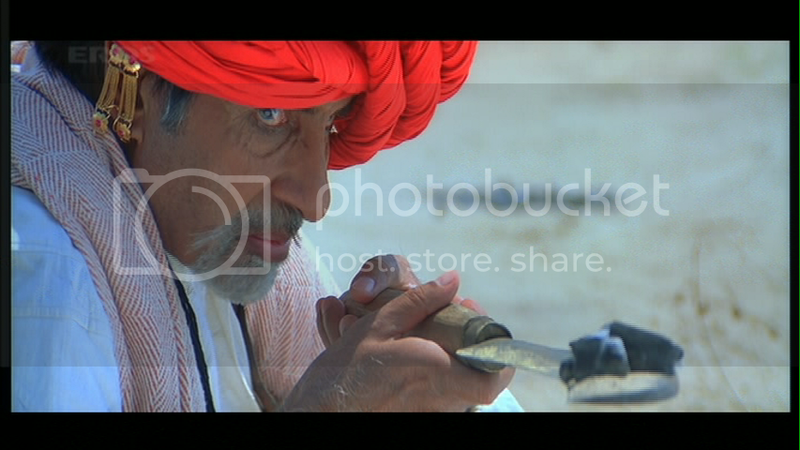 The whole of Paheli felt soulless to me and left me feeling kind of meh. The ghost was selfish and feminism - WHAT? Ghosty manipulated Lachchi to get his own way. I got pissed off with all the "never leave me, promise me you'll never go anywhere without me" stuff. AND SHE PROMISED HIM! So much for that! Most poignant moment for me was Kishanlal hugging that footprint-y sheet. I want to hug him. Despite the ghost's charms, this is the only movie of SRK I can't find the motivation to watch on repeat. It's not infused with commercially entertaining elements..is all I can conclude about it. Wish there were more Rani-SRK1-SRK2 moments. This film makes me squee happily. I don't know if it's the ravishingly gorgeous cinematography, the unapologetic fairy tale aspect, the short roles by Sunil Shetty and Juhi Chalwah or the fact that the ghost seemed more human than the humans. I could have done without the Big B appearance which felt gratuitous at best. I agree that the feminist aspect escapes me. Maybe I'm just missing some cue. I think the husband who hies off to make money is a cracker of epic proportions but this is a fairy tale, isn't it? People do weird stuff in fairy tales. I find this one charming, if short at just over 90 mins.